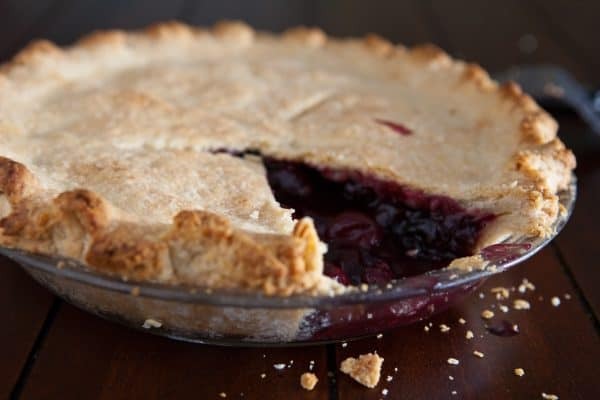 Does the thought of making pie crust send shivers up your spine. I know some people that actually have the magic touch with pie crust, but I’m not one of them. I’ve relied for the most part on Pillsbury or Betty Crocker pie crusts for most all my baking for as long as I can remember. 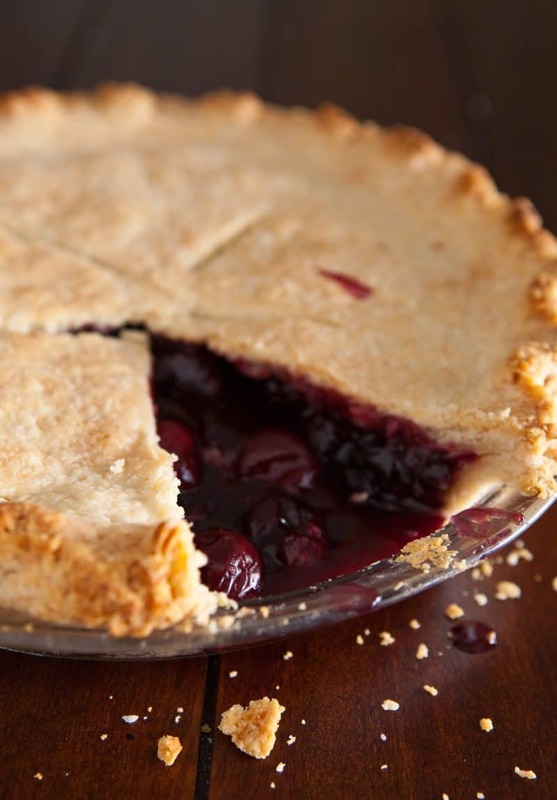 Every time I’ve attempted a homemade pie crust for a fruit pie like this, it hasn’t been the best. Fortunately, everything changed for me last week when my husband bought home the single best cherry pie I’ve ever had in my life. One of his patient’s had made it and sent him home with our dessert for that evening. The crust was perfection, better than anything I’ve had. I begged him to ask her for the recipe, and later that week, he brought home the holy grail recipe of all pie crust recipes. This recipe has a secret ingredient that I had never heard of before, vinegar. After some quick searching on my phone, I learned that the vinegar makes a chemical reaction that prevents all that tough gluten from forming. I’ve read you can also use orange, lemon or lime juice to get the same effect. 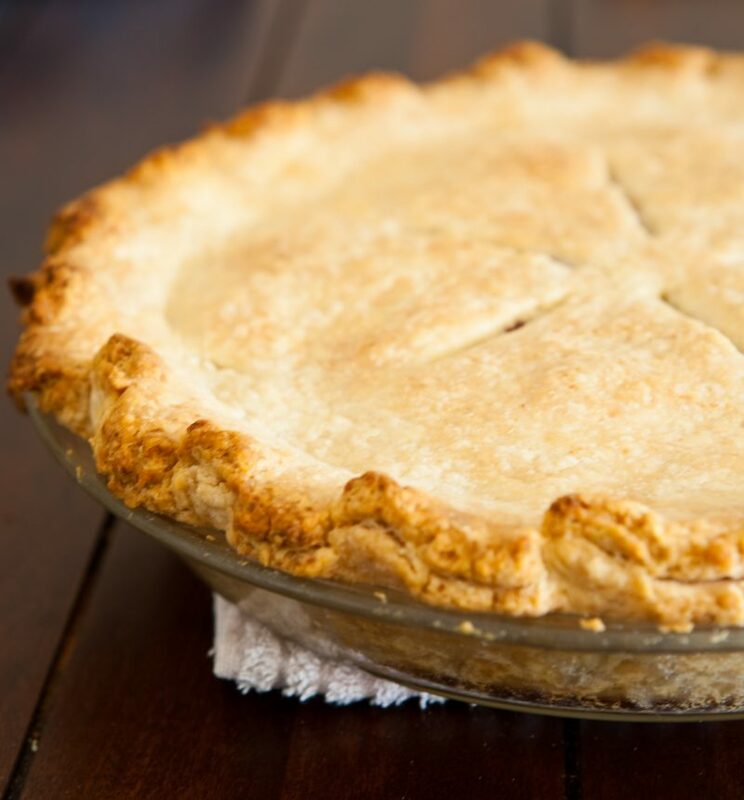 The result is the most tender, easy to work with pie crust ever. Since it’s cherry season, I had to use a bag of fresh sweet cherries. I pitted them, added some sugar and pomegranate juice and simmered them with flour until thick and rich. Then I baked the pie until golden. I made my crust a little thicker than I had intended, but it doesn’t matter with this recipe, the crust was still tender. Her original recipe calls for shortening. I changed it to butter and the crust was still perfect. Either works well, although shortening will give you more of a flakier crust, and butter gives more of a crumbly crust. I tried to wait until the pie cooled, but I just couldn’t, so the cherry goodness puddled. Heat oven to 425°. Add cherries, sugar, flour and pomegranate juice in a small saucepan. Bring to a boil and reduce to a simmer. Simmer until juice is very thick and dark, stirring occasionally, about 20 minutes. While filling is cooking crumb together with a pastry knife or fork the flour, sugar, salt and butter. Add 1 egg, the vinegar and cold water. Mix until just combined. Divide dough in three balls. Refrigerate or freeze the third ball of dough for later use. Roll the other two balls of dough out and place one pie dough in pie plate. Spoon in cherry filling and place on top pie dough. Crimp edges and cut slits for venting in the top of the pie. Place in preheated 425° oven. Bake for 30 - 35 minutes or until brown and bubbly. I shared this photo on Instagram yesterday. I love sharing photos on Instagram and twitter as I cook through the day. I always mean to take more photos during the day. It’s so much fun. This is the new HTC X phone from AT&T. I’ve had an iPhone for years, but since my sister and father-in-law are absolutely in love with this phone, I thought I would give it a test drive. I use my phone all day. We don’t have a home phone, so my cell is pretty much in my hand, on my desk, or in the console of my truck 99% of the time. The other one percent is when my son is playing his games on my phone. I use it constantly to Google and map stores to help me find ingredients for recipes or new cook or bakeware products. I also use it to search cooking forums to answer recipe and cooking questions. I use it to surf Pinterest and Stumbleupon for cooking inspiration. I play scramble and words with friends while I’m waiting for things to come out of the oven, and I even check the weather almost hourly to adjust timing of my cooking so I can shoot in the “best light available.” I also use it to quickly answer emails during the day, and stay connected to family and friends with phone, text, twitter and facebook. Since I demand so much out of my phone, I didn’t expect much from this new phone. But to my surprise, it does everything I ask of my iPhone. The screen of the phone is a little larger, and a little clumsier to hold in my hand, which is a little petite. It seems to be more suited to two hand texting, instead of one hand. However, for my husband, who has large hands, it wasn’t an issue. I do like the looks of the phone, it’s gorgeous, but felt it was more fragile, but that’s just my opinion. My iPhone is encased in a Griffin Survivor Extreme-Duty iPhone Case (for military). There are Otterbox cases for this HTC phone, but no Griffin cases yet. And since I’ve went through 2 Otterboxes in a short period of time (yes I know I’m rough on phones) I would have to wait to wait for a Griffin case for this phone before I could make the switch from my iPhone. However, I did convert two friends already, just by them playing with my new phone. They loved it. One even switched from an iphone to this phone. My friends fell in love with the larger screen and more attractive (or maybe just different) interface. My sister who already had the phone) loves the camera, and I do too. You can set a timer on it, control the ISO, and use filters while taking photos in the camera’s built-in app. Although there are apps for iPhone that do the same thing, it sure is convenient to have all those features ready at your fingertips, right out of the box. It’s what you do, whether it’s cooking, photos, or just keeping in contact with everyone, with what we do, AT&T’s amazing service and exceptional smartphones and devices. 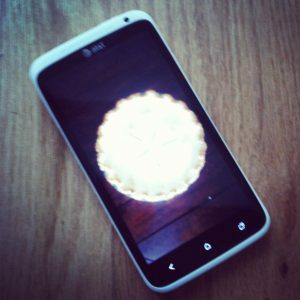 For a chance to win the same HTC One X (valued at $500 – service not included) phone I’ve been testing, just tell me in the comments section below how you use technology to assist in your foodie endeavors like searching recipes, searching food blogs for inspiration or using recipe apps. Giveaway ends September 9, 2012. Winner announced September 10. 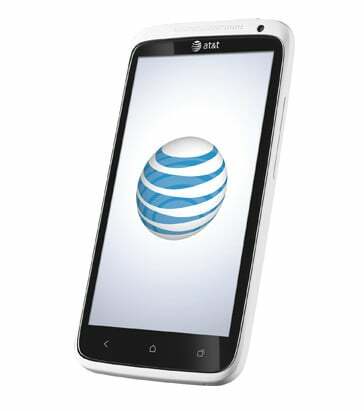 Disclaimer: I was compensated for my time and received a phone for review and one for giveaway from AT&T. I use my phone to search for recipes all the time. Much easier to bring into the kitchen than my computer! Nice! What a great combination and that homemade crust looks SO GOOD! I’m constantly saving recipes to print out later but grew tired of copying the text and saving to a Notepad document and then having to save the accompanying photo. Some sites have a no-right click script and I can understand they don’t want anyone to steal their original work, but I don’t want to re-publish it under my name, just want to add it to my recipe collection! Saving the entire page works, but that also saves adverts and scripts embedded in the page. I’ve known about pdf format for a long time, but it was just recently I discovered a little bookmarklet that allows me to save a page as pdf. I use Pinterest to bookmark gluten-free and dairy-free recipes that I can make for my family, and tweet them out to my community! I also use Evernote and Evernote food to organize, and download lots of recipe books on my iPad. Vinegar, eh? Brilliant! I never would have thought of it. I also use my phone to search for recipes. I agree with Rachel that a phone is much easier to have in the kitchen than my laptop. I love the idea of using vinegar in a pie crust. Ooh, I think I’m going to have to give this a try this week. Thanks for sharing! I do love making my own pie crusts but sometimes help from the store is a life saver. I love the pomegranate mixed with the cherry! I could use the phone for checking up on recipes when I am at the grocery store, or looking for some ideas to make for dinner. I love recipes. That pie looks great, can’t wait to try. I use my phone all the time for searching recipes in the kitchen. Pie is hard to beat and I love the cherry and pomegranate combo. I don’t get cell service at my house but when I’m out I can’t live without my phone! Since we don’t have a phone like this (still old school cell), and I have so wanted one, I know I would use it to check recipes, blogs for recipes and suggestions, store prices, weather, directions, etc… This would so be our new adventure. Would love to have one! Where is the part of instruction with the flour and vanilla in the filling?